A pretty cool conspiracy / spy thriller about a team of high tech operatives who stumble on something very dangerous. 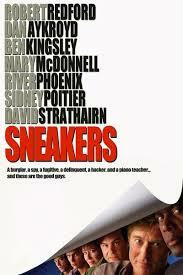 Sneakers is a pretty cool conspiracy thriller movie. It’s the story of a team of spies who are blackmailed into doing a job for a mysterious employer. The job, itself, is also a mystery, involving the stealing of a box that nobody knows the details of. The guys go to work in stealing it, and as the movie goes on, all of the questions that were set up in the first parts of the film, find their answers. There are plenty of cool ideas on hand here, but most of them tend to come in the first half. That’s where the mystery is really kicking at full force and where we see the use of elaborate spy technology. The longer the movie goes on, however, the more it starts to feel like every other spy thriller. By the end, we are basically seeing a recycling of scenes that already happened earlier in the movie. The film is definitely good, and enjoyable, but it does start to feel routine, the longer it goes on. Sneakers are a cool movie. It’s very much like other movies that we’ve seen before, and yet it’s still a lot of fun. One might even say that this movie plays to the formula, but handles its situations better than most movies in the genre. It’s a conspiracy / cover-up movie involving spies and secrecy. Star Robert Redford certainly knows his way around this kind of material. He starred in one of the classic seventies paranoia thrillers that this movie is modeled after…three days of the condor. He also starred in all the presidents’ men, which in many ways was a political version of this kind of film. And later on in his career, Redford made and starred in the movie spy game, which also has ties to this kind of film. As far as the conspiracy / thriller movie goes, Redford is the man for the job, and with Sneakers, he brings a routine story to life here. The movie is about Martin Bishop (Redford) and his team. When the film begins, we meet a younger Bishop in a flashback, stealing money from political parties by cracking passwords and codes, and then donating that money to worthy causes. He’s a naive Robin Hood type, out for the good of the common people. And he nearly gets busted by the police, but narrowly avoids that fate as his friend and partner does get taken away in his place. Over twenty years later, we join up with Bishop, as he is a part of a team of secret stealers. We are with them as they break into a bank in the middle of the night, take over the phone systems, and convince the security guard that everything is okay. It turns out, these guys are not robbing the bank at all, but were actually hired by the bank to find weaknesses in their security system. This is what Bishop and his team does. They sell their services out to companies who want their systems tested. Between the flashback opening, the bank robbing present day introduction, and then the reveal that this is all part of a test, and the Bishop and his team members are actually good guys, things are off to a pretty nice start. Now the real storyline begins as two men in suits come to visit Bishop with files and photographs about who he was in his past life. They know about the time when he should have been arrested and have all the records of his former crimes. Only they don’t want to use them. Instead, these guys want him to do a job for them. They want him to steal a mysterious black box. The men won’t tell Bishop what the box is or why they want it, but if he does this for them, then his records will be destroyed. There will also be a large payday for him and his team members. That’s the deal, and Bishop brings it to the guys, which is a cast of known actors. There’s Sydney Poitier, river phoenix, Dan Ackyroid, and David Strathairn. The team members agree to help Bishop, not because they care if he goes to jail, but because the money offer sounds too appealing to turn down. And so they’re off and running. The guys start investigating the engineer who invented the box, going to his lectures, and spying on his office. They learn of his secretary, who he is having an affair with, and eventually get Martin into the office to steal the box. When he gets it out of the office and brings it to his team members, the first part of the movie is over. Now the question is no longer how do we get the box, but now it’s a matter of what the box actually is. The guys mess around with a few things, and figure out exactly what this thing is capable of. But there are still mysteries at hand, such as who those guys from the beginning were and why they want this box. Martin has another run in with them, when they kidnap him, put him in their trunk, and drive him to a secret headquarters. Once there, Martin meets the man in charge of the organization, played by Ben Kingsley. This man, named Cosmo, is supposedly the big bad guy of the film, yet he never really does anything that sinister. Sure, the things he stands for and plans to do are terrible, but he also seems to like Martin and want to keep the guy alive. The two men who shoot the people Martin is with, when he is kidnapped, however, do more to present themselves as real bad guys. There’s a great sequence when the guys find a way to figure out where those kidnappers took Bishop. They ask him to recall sounds he heard and then in a way that reminded me of the scene in the fugitive, where they isolate sounds near the l train on a recorded message, these guys play with different noises and the spacing in between the sounds, trying to figure out where Martin might have been when he heard these things. The scene is definitely hard to believe (would he really remember these sounds so well? ), but it’s still kind of cool. We are now gearing towards the end, and unfortunately the movie starts to go downhill a little for it’s final act. That’s because the end of the movie is really just about more break INS to top secret, heavily secured offices. We’ve already seen this earlier on, when Bishop and his team had to steal the box. At this point, the movie is really just repeating itself. Sure, the stakes are higher now, but the situation is too close to one we have already seen, earlier in the film. As far as break into highly secured rooms or office scenes go, there will never be one better than the scene in mission impossible, with tom cruise hanging upside down, making sure not to sweat. The scenes in Sneakers have plenty in common with that classic scene (you have to move around the room super slow, so as not to set off censors), but it doesn’t really come anywhere close to being as cool. 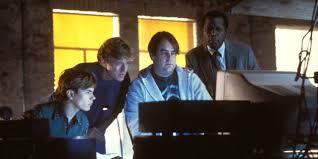 Sneakers are a fun movie about high tech spy gear and secret manipulation. It’s enjoyable and clever at times, but in the end it turns out to really be just like other films we have seen before. Whatever originality the movie had all come in the first half. And it pretty much ended when we found out what the black box was. Sure, Cosmo’s motivation for wanting the box is pretty cool too, and totally unpredictable, but all of the sneaking around and having everything go just right because a little too much as the movie goes on. It’s a good movie, but it is also somewhat forgettable when compared to other movies of the same nature. The mission impossible films are definitely better spy movies, but those films tend to be either overly complicated or overly action-oriented. Sneakers are neither one of those things. It is never too challenging to follow, and is much more of a thriller than an action film. It’s a fun movie, but nothing special or incredibly unique.